The day started out innocently enough, but around 2:30pm while walking outside to the canteen I noticed anvil above and heard thunder shortly after. 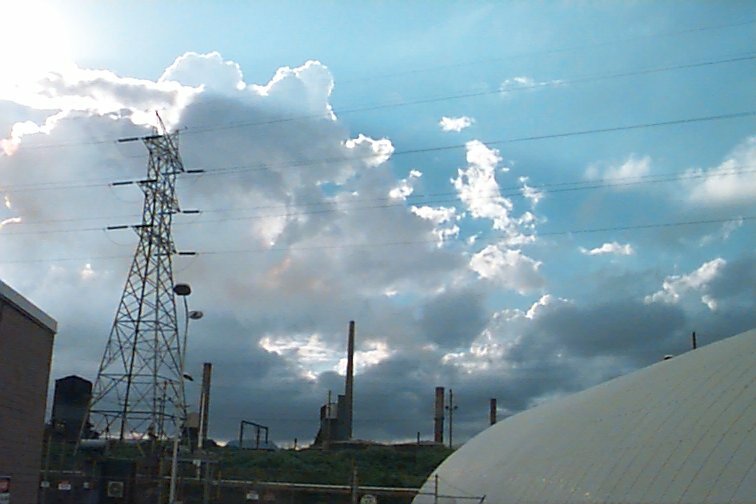 I quickly grabbed the digital camera and made an excuse about taking piccies of our waste water treatment plant before going for a walk. The scene along the Illawarra escarpment was great. It was very dark around Robertson way, with no features visible, but it was from this direction that the anvil was coming. The lower level winds were very moist from the NE with lots of low cloud which usually fogs up the escarpment (about 500m elevation). Further along, closer to Mount Kembla was a nicely developing cell, which was just starting to show a backshearing anvil as I took a couple of photos. Also, further up the coast, probably around Cambelltown/Camden area was another cell in a slightly earlier stage of development, ie no anvil. The prevailing upper winds seemed to be from the SW judging by the anvil direction, but mid level winds seemed N, it was hard to read, but that was my impression looking at clouds at different levels. So back into the office with some light rain, I decided it was time to leave work for the half hour ride home. By this stage it was 3:30pm, and I was treated to a few CG's from the storm west of Mt Kembla, which seemed to be travelling north at a rate which matched my progress by bicycle. 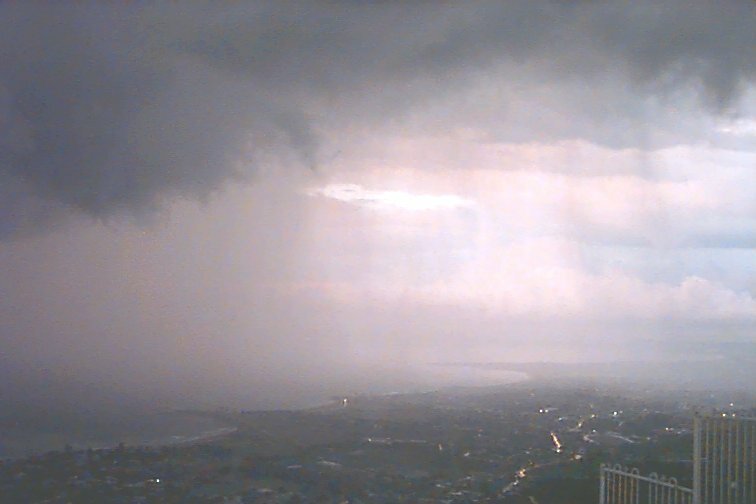 The rain got progressively heavier as I neared home at North Wollongong, and thunder was quite regular overhead, which I must assume was from anvil crawlers. 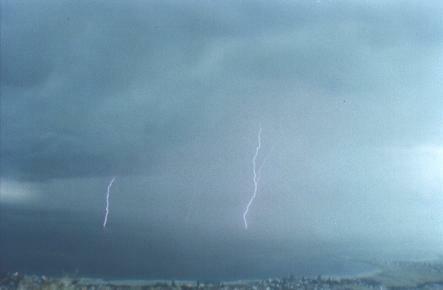 I arrived home just after 4:00pm, attempted to take a couple of lightening shots from my balcony, which was no good. As the storm seemed to clear Mt Ousley I decided to chase the back of it north. 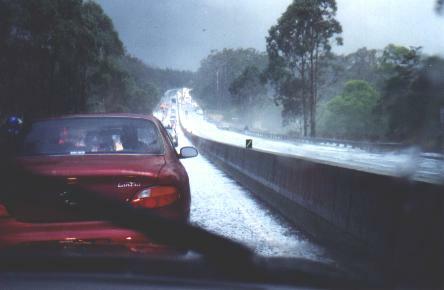 Arriving near the top of Mt Ousley, traffic slowed, and there was a layer of hail all over the road. The first accident on southbound lanes was slowing things up. 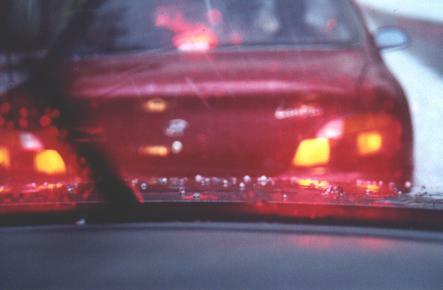 As I was driving, I was taking pictures, some with the digital camera I had brought home from work, others with my 35mm. Over the top of Mt Ousely and I was treated to a surreal mammatus shot (which was blurred on film) and heaps more hail, but the storm was getting away. An overturned car under the Picton Rd overpass again slowed traffic as the hail started coming down again. Just after this I was stopped in the northbound lanes by two lanes of traffic refusing to go past the scene of a15 car accident on the southbound lanes. Some people even stopped in the emergency lane, stopping any progress, even for emergency vehicles arriving at the scene. While I was stopped, hail began falling quite heavily as the last of the storm went overhead, most hail was up to around 8-10mm in diameter. Finally traffic was driven on by the police and I got to Bulli tops in time for a spectacular lightening show. 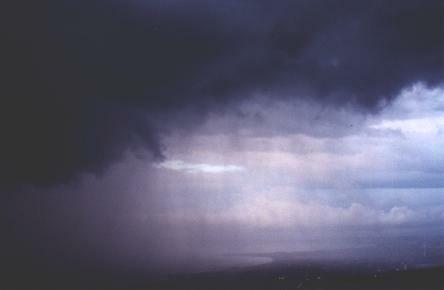 The storm had travelled out to sea, off the Bellambi/Wonoona area. 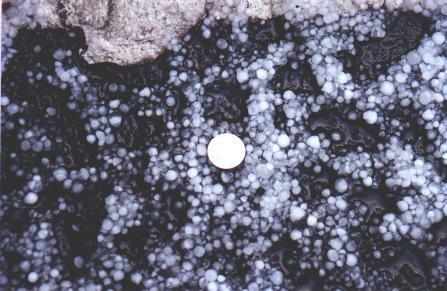 The hail shafts off the back were distinct after what I had just been through, and were not part of the main storm. The lightening seemed to be increasing in frequency as well. But the storm shape interested me. The front end seemed much lower than the rear, with a solid precipitation shaft to define it from the surrounding low cloud. I hung around for about half an hour, until dark, and my last shot on the film. Making my way home was very painful, it took 25 minutes to crawl 1km to Bulli Pass. In this time another electrically active storm neared from the west, and light hail was beginning to fall as I came down Bulli Pass. 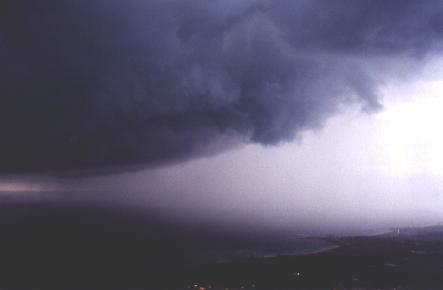 Then it was an easy drive home, with hail apparent in the median strip along the Northern Distributor near Corrimal, as tendrils of mist floated out across the road.Then the lightening continued at home for another hour, some within 600m (2 sec between cg and boom). Also, a very heavy period of rain with some light hail to finish off the show at around 7:30pm. Some quite nice looking cb's off the coast this morning, with anvils. So with a forecast for developing showers about lunchtime, I can only hope for something akin to yesterday to again develop, as I have the car today. Making my way home was very painful, it took 25 minutes to crawl 1km to Bulli Pass. In this time another electrically active storm neared from the west, and light hail was beginning to fall as I came down Bulli Pass. 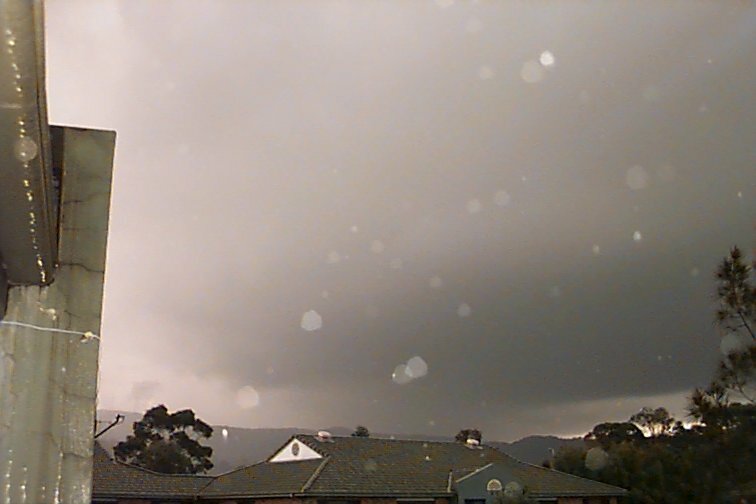 Then it was an easy drive home, with hail apparent in the median strip along the Northern Distributor near Corrimal, as tendrils of mist floated out across the road. 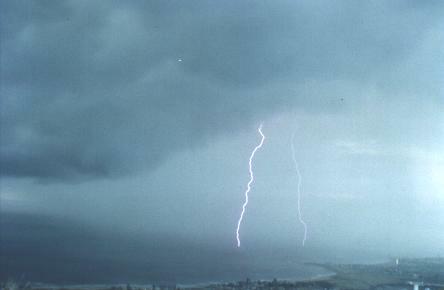 Then the lightning continued at home for another hour, some within 600m (2 sec between cg and boom). Also, a very heavy period of rain with some light hail to finish off the show at around 7:30pm. Some quite nice looking cb's off the coast this morning, with anvils. So with a forecast for developing showers about lunchtime, I can only hope for something akin to yesterday to again develop, as I have the car today.